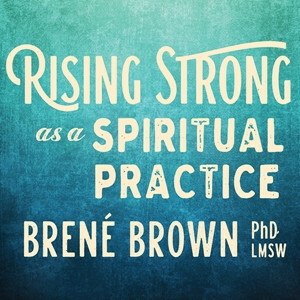 On Rising Strong as a Spiritual Practice, Brené defines spirituality as something not reliant on religion, theology, or dogma—rather, it is a belief in our interconnectedness and in a loving force greater than ourselves. Whether you access the sacred through traditional worship, solitary meditation, communion with nature, or creative pursuits, one thing is clear: cultivating your own approach to spirituality gives you an irreplaceable resource to help you persevere through hard times and arise stronger and wiser than before. This presentation, recorded in Boulder, CO in late 2016, is remarkable. Dr. Brene Brown is at her best, describing her research on shame, courage, and vulnerability in her wonderfully down-to-earth style. Weaving how she's applied the steps of her "Rising Strong" data with examples from her own life is genuine, honest, and funny as hell. I can't recommend this audio presentation highly enough, personally and professionally.